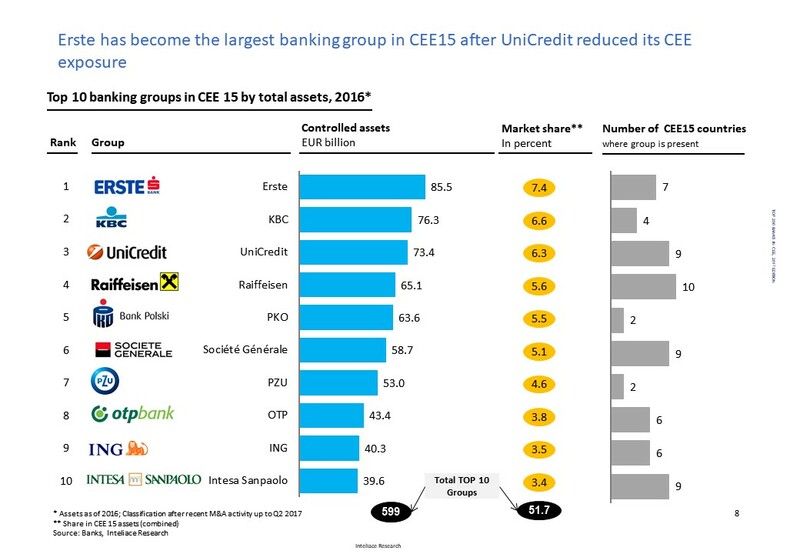 Total banking assets in CEE15* reached 1.16 trillion EUR as of December 2016, after adding ca.4% value within a year. The profitability of major CEE banks surged with weighted ROA and ROE jumping to 1.18% and 10.2% respectively in 2016. Despite recently observed convergence trends, there are still significant differences among CEE countries in terms of banking intermediation levels. While banking assets per capita exceeded EUR 20k in Czech Republic, the benchmark was nearly 6 times lower for Albania and Bosnia-Herzegovina.The level of financial intermediation for most of CEE is still extremely low if compared to Western Europe and the gap is expected to narrow gradually. -------------------------------------------------------------------------------------------------------------------------------------- *CEE15 includes Poland, Czech Republic, Hungary, Slovak Republic, Romania, Bulgaria, Estonia, Latvia, Lithuania, Croatia, Slovenia, Serbia, Bosnia and Herzegovina, Albania, and Macedonia. Copyright © 2006-2019 Inteliace Research. All Rights Reserved.